Three years ago, a group of City of Moncton staffers boarded a plane, bound for Winnipeg. They were on a fact-finding mission to discover if Moncton, N.B. could evolve from building traditional bathtub-like stormwater retention ponds to incorporating naturalized retention basins in neighbourhoods instead. Moncton was dealing with intense and frequent storms, and heavy precipitation. They needed a plan. “We had a lot of water quality issues in the city around our storage areas,” says Elaine Aucoin, Moncton’s director of environmental planning and management, citing increased occurrences of e-coli and blue-green algae. In 2002, the city had responded to water quality issues by constructing wetlands in centrally-located Centennial Park. Unlike traditional stormwater retention ponds, wetlands store and filter vast amounts of water. They also capture carbon, add biodiversity, and become natural focal points of a community. The success of the Centennial Park wetland was a watershed moment. Staff realized there was potential for similar projects. “We had seen the benefits at Centennial Park, but we needed to see how it would work when wetlands were integrated into neighbourhoods,” says Aucoin. The investigation took Aucoin, along with city planner, Sebastien Arcand and director of design and construction, Alcide Richard, to Winnipeg. Manitoba’s capital is home to Native Plant Solutions (NPS), a consulting arm of DUC that’s pioneered the design and construction of naturalized stormwater retention basins. Wetland-like in appearance and function, the basins incorporate natural biological processes to filter and store water. 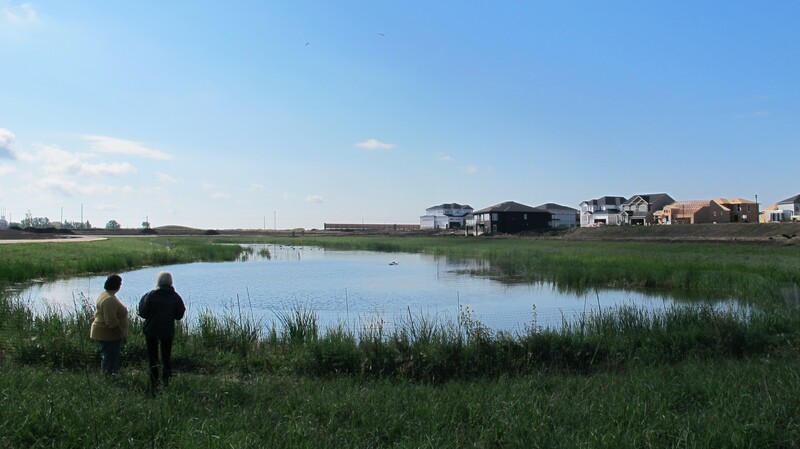 Since 2002, NPS has naturalized more than 85 stormwater basins in Winnipeg, and in the process demonstrated that these wetland-like retention ponds can be integrated into communities. “That trip to Winnipeg sold it for me,” says Richard, noting the three-day tour, guided by staff at NPS, addressed all his concerns. “We had a developer with us who got pretty excited.” It was a positive sign – buy-in by ratepayers and industry is important to success, Richard notes. Aucoin says the trip convinced her that managing storm water could be done in a way that adds to the quality of life in a community. “[Wetlands] look a lot nicer, and provide the community with a place to gather around, unlike dry ponds that are often fenced off, and waste of space,” she says. The Moncton delegation set about presenting their findings and recommendations to council. Their project received the green light. In 2015, they worked with DUC staff in Atlantic Canada, NPS, and WSP Engineering Consultants to draft a set of naturalized stormwater management guidelines. The result is an innovative document that will transform all future development in the city. “This is a huge leap from where we were at, to where we’re going,” says Arcand. “We need to start building for the millennials,” he adds, noting that generation places high value on green infrastructure. Since completing the guidelines, Moncton has been recognized with an environmental award from the Canadian Association of Municipal Administrators. And they’ve sparked a conservation conversation. In the winter of 2014-2015, Moncton received 450 centimetres of snow, or close to 15 feet! In 2015, the City of Moncton worked with DUC to construct a shallow wetland to filter runoff at the city’s snow dump. Moncton’s new naturalized stormwater management guidelines set parameters for constructing retention ponds. They also provide municipal guidelines for the city and developers to implement other naturalized approaches, such as rain gardens that contain plants capable of withstanding extreme moisture and nutrients.